In the web of maneouvres over Iran’s nuclear program in the last decade — still unresolved as Tehran and the 5+1 Powers seek a comprehensive agreement — the story of scientist Shahram Amiri may be one of the strangest strands. In 2009, Amiri disappeared while on pilgrimage to Saudi Arabia. He surfaced in the US to competing claims: the Americans said he had defected with valuable information about Iran’s covert push for a nuclear weapon, while the Iranians said he had been kidnapped. Several months later, Amiri suddenly returned to Iran. It was unclear why the Americans had allowed him to leave, but the hero’s reception for him fit Tehran’s narrative of its valued scientists — five of whom had been assassinated — pursuing technological progress despite the threats to them and their country. Then Amiri disappeared again. In January 2011, an Iranian expatriate site said he was imprisoned in solitary confinement, under interrogation by Iran’s intelligence services. The claim caused a ripple in Western media but little more. The defector/kidnap victim turned hero turned political prisoner vanished. Now, 3 1/2 years later, Amiri has resurfaced. It has been close to two years since we were last allowed to visit him. He has not called and we have appealed to many places. We have appealed to the office of Ayatollah Khamenei and the office of Mr. Larijani. Last week we went to the Defense Ministry and told them ‘he used to work for you and you yourselves declared him a national hero. Why don’t you set him free?’ All they said was that it was a security case and had nothing to do with them. 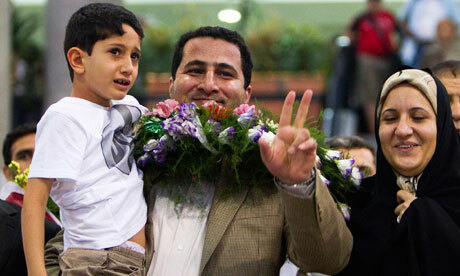 The family said Amiri was sentenced by a military court in 2012 to ten years in prison and five years of exile. On July 6, Amiri’s wife went to visit him at an Iranian court, bearing some money, clothes and fruits. But authorities refused to permit her to speak to him, and Amiri shouted to his wife as he was being led away that he was on hunger strike. These recent developments only serve to further muddle the long saga of Shahram Amiri, whose past remains shrouded in mystery. While the Islamic Republic has been publicly committed to casting him as a national hero, his detention and clandestine sentencing suggest that Iranian officials believed he collaborated with American intelligence to some extent. The real truth, whatever it may be, seems of little use to Amiri himself, who has emerged as one of the clear-cut losers of the Iranian nuclear program.